“The race to the bottom” is a virus that has been going around the world for a long time. The parts of economy where wages often don’t pay the bills, is mostly affected by it. Cleaners and private Security guards are in almost every economy amongst the lowest paid. In parts of the world where there are no collective agreements or legal minimums it is the worst. But also, a legal minimum is not guarantee that workers get what their entitled too. Simply because there is no legal minimum “police”, workers are not organised and cannot afford to fight against their employer by themselves. There are about 30 million cleaners and 20 million security guards in the world. It is an enormous workforce and they are essential to economy. Airplanes cannot fly without security. Public space, like shopping malls would have to close their doors if there is no supervision. And imagine how, airplanes, public buildings, or even your own workplace would look like if there was not someone to clean it up. Still the importance of the job does not pay of in the wages. How different was that in the old days. 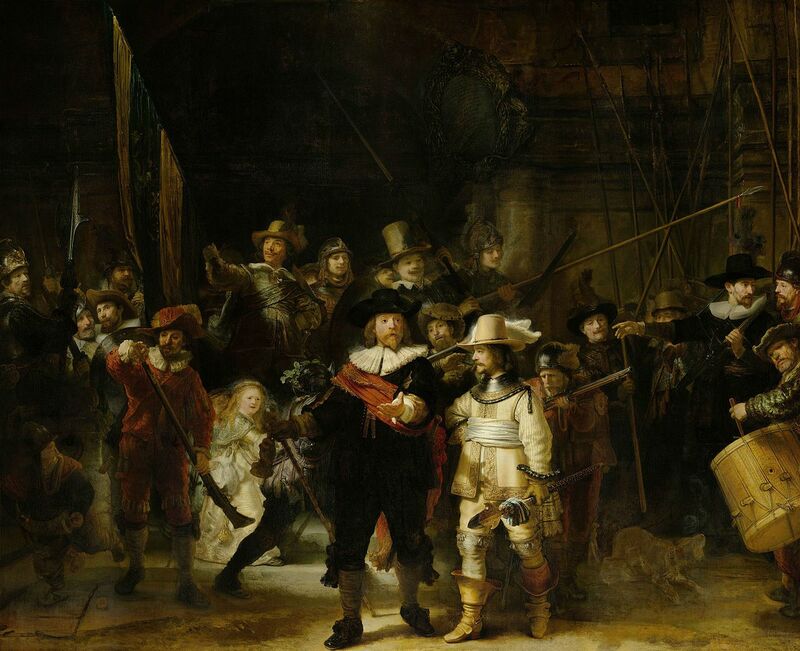 Rembrandt pictured what are basically private security guards in his most famous “Nightwatch”. Actually, the original name of the painting is “Militia Company of District II under the Command of Captain Frans Banninck Cocq” Its officers were wealthy citizens of Amsterdam, appointed by the city magistrates. Joining as an officer for a couple of years was often a stepping-stone to other important posts within the city council. The members were expected to buy their own equipment: this entailed the purchase of a weapon and uniform. Each night two men guarded their district in two shifts, from 10:00 p.m. until 2:00 a.m., and from 2:00 a.m. until 6:00 a.m., closing and opening the gates of the city. How different now, where we see guards at their post from 8, to sometimes 16 hours a day. The only similarity is that many of them must buy their own uniform and arms too. But they are certainly not wealthy citizens with a great career perspective. In cleaning there are no ancient stories to tell. It has always been an invisible job. For long, it must have been slaves and maids, always the lowest in the peck order. And Cinderella, the maid that made it, is a myth. Nowadays cleaning and security is an outsourced business, ran by some of the largest multinational companies in the world and by numerous small family owned companies. All making money on low paid hours and some of them make so much, that you find them in the rankings of the richest people in the country. It is a highly competitive price driven market. For a company to make money, they have to keep the wages as low as possible. The clients of cleaning companies can easily go for the lowest price because there is always one who can do it cheaper. If a purchasing department has to squeeze their suppliers, they will not start by squeezing their lawyers or IT contractors, no they always squeeze at the low end. Workers in many countries where able to raise the standards by unionising and fight for collective agreements. But still it is still a low standard and in some countries no standard at all. That is why we organise people and unite them. Every year on the 15th of June we celebrate our victories and get ready for the next battle. We call it international justice day and for the past decades it moved people around the globe. The race to the bottom is a virus and we have the vaccin: organise and unite!